Two tries from captain Will Evans set Leicester Tigers on the way to a 24-13 victory over Wasps ‘A’ in the Premiership Shield at Welford Road on Monday evening. Fly-half Joe Ford scored the other points, including a second-half try as Tigers came from 7-0 down early to record a first win of the season in the second-strong competition. Wasps grabbed an opening try in the 12th minute but skipper Evans dotted down from a forward drive to level the scores before two penalties from Jacob Umaga gave the visitors a 7-13 lead at the break. Evans added his second soon after the restart as Tigers finally got in front at 14-13 and Ford finished an enterprising break from Charlie Thacker to stretch that advantage. As well as Evans, the Tigers XV included Valentino Mapapalangi in the second row and Under-20s internationals Tommy Reffell, Sam Lewis, Joe Heyes and Tom Hardwick as well as academy graduates Owen Hills, Thom Smith and Thacker alongside summer signing Sam Aspland-Robinson. There was an early escape when Aspland-Robinson was forced to scramble back and dot down behind his own line, but the Tigers pack stood up to the five-metre scrum and earned a penalty to clear their lines. The first points of the evening came on 12 minutes with Wasps prop Tom West capitalising on loose defence at a ruck to score to the right of the posts and Umaga added the conversion to put them seven points in front. Moments later Umaga took on a penalty from halfway but saw his low kick come back off the face of the crossbar and Ford kicked clear. Another scrum on the Tigers 22 ended with a penalty for the hosts and, after a third set-piece penalty on 21 minutes, referee Dan Parrott spoke to the visiting front row. Evans got his first touchdown in the left-hand corner from a lineout drive and Ford added the conversion to level the scores. A strong run on the right by Aspland-Robinson gave Tigers more valuable territory and Kwaku Asiedu almost got free on the left before being tackled into touch 10 metres out. Thacker then showed his pace in defence, giving Josh Grimes the outside line and then taking the full-back into touch with a low tackle on the Tigers 22. Umaga added a three-pointer after the Tigers pack had been whistled during a big push at a scrum and he added a second after Ford was yellow-carded for offside as he rushed out of the defensive line close to the posts to give the visitors a six-point lead at the break. Tigers took the lead for the first time when Evans scored again, capitalising on a drive in the right-hand corner. Hardwick took on the conversion kick with Ford in the sin bin and he judged it well to make it 14-13. Ford returned at the restart and his hack ahead took Tigers back on the attack and his side enjoyed a goof spell of field position, driving strongly again from a lineout to stay in their rivals 22 until the fly-half added the third try on 52 minutes, latching on to a break from Thacker to score next to the right-hand post. He added the conversion to take the lead out to eight points. There was still work to do in defence, though, with Mapapalangi’s lineout steal keeping Wasps out and then Adsiedu chasing back to gather a crosskick from Umaga as Jake Sharp chased for the visitors. Ford stretched the lead with a penalty from 40 metres with little more than five minutes left on the clock and some strong phases of defence kept the line intact as Tigers closed out the win. Tigers having to deal with some late Wasps pressure, but manage to evade the efforts of Wasps backline and Dan Parrott blows for full-time. Tigers record their first Premiership Shield win of the season as the action comes to a close here at Welford Road. Thanks to the hundreds of fans who joined us here at the home of Leicester Tigers for this evening's match. Tigers first team are next in action this Saturday, December 22 (3.00pm) with the visit of Harlequins in the Gallagher Premiership. A safe trip home to all. Tigers defence holds firm and Tigers drive into the Wasps half following a quick tap from Tom Hardwick. Keston Lines chases the long ball and Tigers pin in Wasps before they find an escape with the boot. A Tigers line-out is lost and Wasps look to come at Tigers again. A monstrous kick from Tigers fly-half Joe Ford flies in well over the posts and Tigers lead by 24 points to Wasps 13 with just five minutes left to play. It's a change at scrum-half for Wasps as Will Flinn is replaced by Josh Nott. Both teams face off in a series of scrums in the Wasps 22, but the ball is knicked by the Wasps flanker before a searching kick tries to find their No.14. but Tigers Kwaku Asiedu clears up for Tigers and it's a Wasps line-out by Tigers five metre line. Taju Atta comes on for Tom Stileman on the wing for Wasps. Keston Lines is coming on for Owen Hill for Tigers with 65 minutes played here at Welford Road. Emil Rupf comes on for Josh Fenner in the second row for Wasps. Tigers Harry Mahony and Dan Cuthbert take to the field in place of Ross McMillan and Sam Lewis. Tigers are beginning to take control of the game winning another penalty and getting the play back in the Wasps half. Tom West and Gabriel Oghre make way for Alfie Barbeary and Ben Onyeama-Christie for Wasps . Joe Ford adds to his second-half try for Tigers as they lead 21-13 with 53 minutes played. Will Wilson comes on Kieran Curran at No.6 for Wasps. Tigers with two replacements at half-time with prop Joe Heyes and wing James Martin making way for David Feao and Dan Lewis. It's Wasps to get us underway as we kick off the second half with Tigers now attacking the Robin Hood stand. Tigers end the half five six points shy of Wasps as the referee brings the first half at Welford Road to a close. Wasps replace the injured Josh Grimes with No. 22 Jake Sharp at full-back. Wasps Jacob Umaga kicks his third kick of the game after Joe Ford's deliberate knock-on. Wasps extend their lead to 13 points to Tigers 7 and Tigers have a chance with the restart before the half is up. Tigers fly-half Joe Ford is shown a yellow card for a deliberate knock-on as Tigers soak up a Wasps driving attack. Wasps made good metres in front of the Tigers posts and looked to find space out wide, but Ford's attempt was penalised and Tigers are down to 14 players. Tigers are penalised in the scrum after the referee has words with Tigers Joe Heyes. Wasps Jacob Umaga chooses to kick just short of the Wasps 22 and successfully kicks Wasps into a three point lead. Tigers 7 - 10 Wasps. Tigers back three seeing a lot of the action in the last five minutes, with darts from Sam Aspland-Robinson and James Martin testing the Wasps defence. The scores stay at 7-7 with both teams pushing to gain the advantage as we edge towards half-time. Tigers begin to stretch the Wasps defensive line after some tidy work James Martin on the right wing. Tigers clear at the breakdown and No. 12 Tom Hardwick finds a gap before looking to play in Tigers No.11 Kwaku Asiedu but is stops just shy of the five metre line. Wasps retrieve the ball and clear their lines. Fly-half Joe Ford adds the extras for Tigers as they level the scores in the 23rd minute. Tigers 7-7 Wasps. And it's driven over from the line-out following a big Tigers maul. Will Evans is the man who gets over and gets Tigers off the mark this evening. Tigers 5-7 Wasps. After some neat work from the Tigers midfield, the Tigers forwards get a chance to assert pressure on the opposing pack. The referee calls a scrum penalty and Joe Ford opts to kick into touch deep in the Wasps half. Tigers line-out and a chance to hurt Wasps. Wasps make a replacement with 16 minutes on the clock as David Langley comes onto replace Alex Hunt at tighthead. Jacob Umaga kicks from the tee for Wasps to extend their lead to seven points. Prop Tom West goes over for Wasps in the right corner after pressure deep in the Tigers half. 0-5 with 12 minutes played. We're 10 minutes in and both teams continue to battle for possession. Referee Dan Parrott penalising both teams for errors in the opening stages but the scores remain 0-0. Both teams exchange possession in the opening few moments as both teams look to get a hold of the game. Wasps broke the line on two occasions but Tigers defence held strong, with Joe Ford clearing Tigers lines. A Tigers scrum in their own five metre is penalised and Tigers with a chance to clear. The teams return to the field of play as Tigers go in search of their first win of the season against fourth placed Wasps. Tigers will be kicking towards the Mattioli Woods Stand with Joe Ford kicking things off. It's a first Development XV start for Tigers academy graduate Jonny Law who was a part of Tigers league winning U18 side last season. Will Evans will captain the Tigers side after being named at open side flanker in a back row which also includes fellow academy graduates Tommy Reffell and Thom Smith. Tonga international Valentino Mapapalangi is in the second row alongside England Under-20s lock Sam Lewis, and front-rower Owen Hills will make his first appearance of the season for the club after recovering from a knee injury suffered during the summer. Joe Ford sits in at fly-half and Charlie Thacker also returns to action for Tigers for the first time this season and former England Under-20s representative Sam Aspland-Robinson will make his first appearance at Welford Road after joining the club in the summer. Academy graduates Harry Mahoney, Keston Lines and Henri Lavin join Tonga international David Feao on the bench. 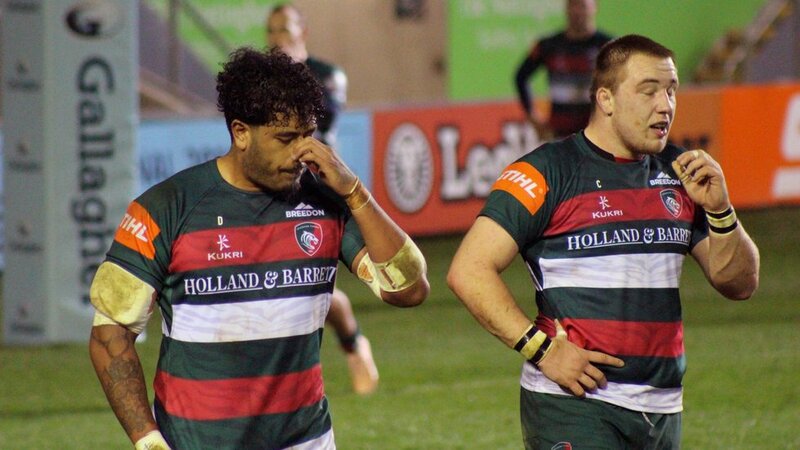 Welcome to Welford Road for live action of Tigers Development XV match against Wasps A tonight. We're 10 minutes away from kick-off as the teams finish their pre-match warm-ups. Will Evans will captain the Tigers Development XV in the Premiership Shield game against Wasps at Welford Road tonight (Monday, December 17) after being named at open side flanker in a back row which also includes fellow academy graduates Tommy Reffell and Thom Smith. Jonny Law, who was a member of last season's Under-18 League-winning squad and started in the Final win over Gloucester, has been named in the No.9 shirt and will partner Joe Ford in the half-backs. Charlie Thacker also returns to action for Tigers for the first time this season and former England Under-20s representative Sam Aspland-Robinson will make his first appearance at Welford Road after joining the club in the summer. Speaking ahead of the game, Tigers development coach Anthony Allen said: "It's an exciting side with plenty of youth spread across the squad and a handful of senior lads who will be expected to lead them around the pitch. "It's been a while since some of these guys have played together, so it's great to have an opportunity for them to get back out there, especially at Welford Road, and put their case forward to the senior coaches for selection." All supporters will be accommodated in the Holland & Barrett Stand and all season ticket cards will gain admission at the turnstiles numbered 1-4. The bar will be open from 6.00pm with turnstiles open at 6.30pm ahead of kick-off at 7.30pm at Welford Road. Season ticket holders have also been sent extra tickets to invite friends and family to the game. For all other supporters, tickets are available on the day, price £5 adults, £1 juniors at the Tigers ticket office.